In today’s internet age, your online reputation serves in the same way as your credit report. Internet searches are widely used by consumers, employers, landlords, even government departments in order to screen out applicants for jobs, loans, grants, and almost anything that is imaginable. Online reputation has become one of the major indicators of whether you gain access to a well-paid profession, an affordable home loan, rental housing in a desirable location. Your company must take diligent steps to accumulate a positive online reputation. Just as your credit history acts as a way of tracking your spending behaviour and habits over the years. It also shows the degree of discipline in you when it comes to repaying loans. On the other hand, borrowers with a meagre record of loan management and repayments have compromised ability to secure loans in the future. A credit record gets accumulated over time, but you can’t repair a damaged credit score by just countable months of positive repayment history. In the same way, your online reputation is cumulative and obstinately difficult to change. All the things that have been said or done by you on the Web, as well as everything that has been said about you, can be easily brought to light for public judgment at the simple click of a mouse. Anyone can get a sense of your personal qualities by just typing your name into Google and glance through a few pages of search engine generated listings. Like a number of people, you might probably be using the Web for a lot of tasks and activities, all this makes your online reputation management tremendously difficult to monitor as well as repair. 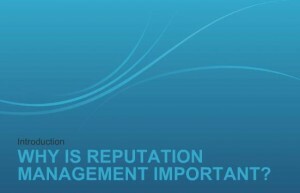 But, now you don’t have to be apprehensive as various online reputation management services have emerged that are dedicated to keeping your online reputation in good repair.